This offer is valid From December 27th through December 31st on selected merchandise only. While quantities last! Shop earlier for the best selection because these items will go fast! 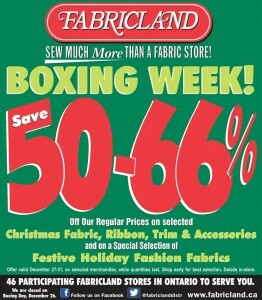 There are 46 Participating Fabricland Stores in Ontario to serve you. FabricLand is closed on Boxing Day so start your Boxing Day shopping at FabricLand on December 27th 2013. Find your closest Fabricland to take advantage of these sales here.